Firebase, the app development platform acquired by Google in 2014, today saw a major update. In addition to several platform-wide enhancements, the company is introducing an in-app messaging services, as well as several major integrations for the popular crash reporting tool, Crashlyics. First, let’s talk about the launch of Firebase In-App Messaging, as it’s arguably the one that’ll have developers champing at the bit. Firebase In-App Messaging lets developers send targeted and contextual messages to users, in order to guide them through the application. These messages can be tracked through Firebase’s built-in analytics tool, allowing for data-driven enhancements to copy and design. Firebase hopes its In-App Messaging tool will allow developers to to improve engagement with users. It could ensure that apps see lower rates of user attrition, by ensuring there’s help on hand when they get stuck. Firebase In-App Messaging can bring up tips and relevant information. For e-commerce sites, the new tool makes it easy for them to direct offers at potential customers, enticing them to throw over their credit card information and spend some money. Messages delivered through Firebase In-App Messaging are fully customizable. Developers can style them with the site’s logo and design, and can also add call-to-actions (CTA) to make them more effective. This tool is rolling out to Firebase users today. Firebase is also extending its existing support for crash reporting platform Crashlytics (which Google acquired from Twitter last year) with new third-party integrations. Users can now export Crashlytics data to Google’s BigQuery service, allowing developers to perform detailed analysis on datasets that are often large and cumbersome. Developers will be able to use Data Studio to visualize their app’s logs, and can set their own retention and deletion policies, allowing them to comply with new privacy legislation like GDPR. Arguably the most useful integration is with Atlassian’s hugely popular Jira ticketing software, which is relied upon by many software houses. With the new integration, developers can create tickets based on crash data, which can be investigated and resolved later. According to Firebase, these new Crashlytics integrations will roll out to developers in the coming weeks. 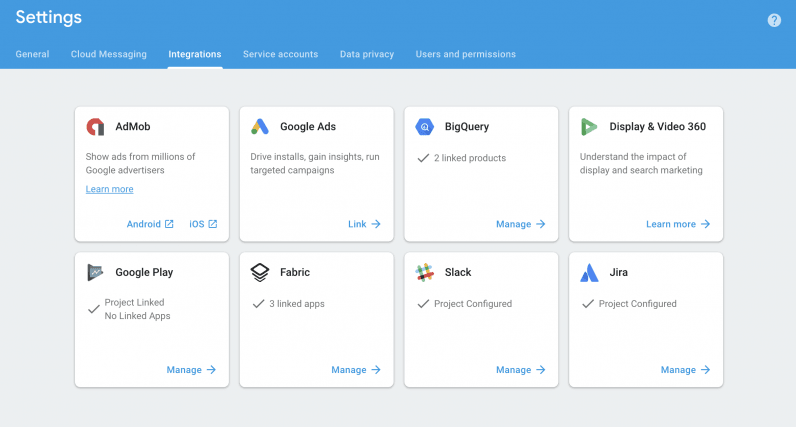 In the meantime, the company is also introducing minor enhancements to Firebase Hosting, the Firebase Cloud Messaging (FCM) API, and the console, which promise to make developers more productive when using the service. You can read more about them on the Firebase blog.